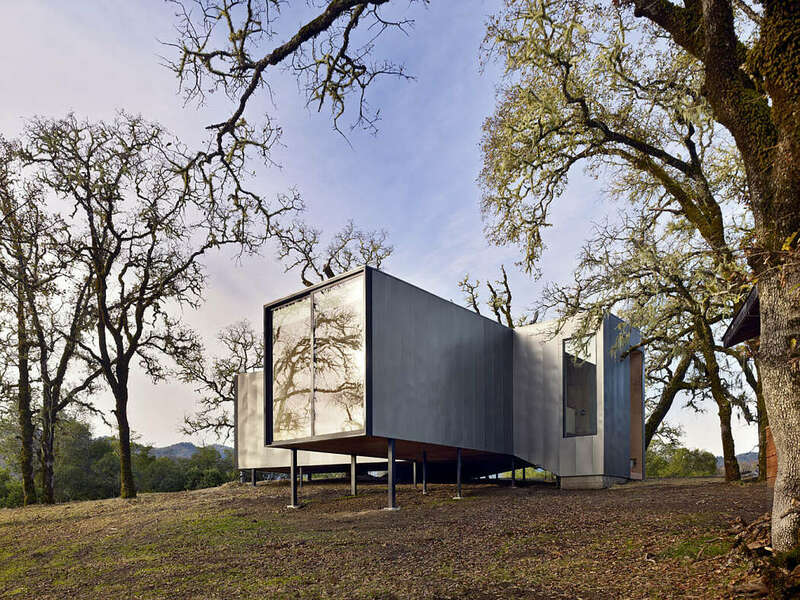 Designed in 2013 by Mork Ulnes Architects, this modern cabin is located in Ukiah, California, United States. Three locally known land formations can be seen from the site of this project: ?Eagle Rock?, a mountain ridge, and the valley of vineyards below. The main challenge was to frame these three separate views while at the same time, preserving each existing oak tree on site. The three fingers extend precisely in between the existing trees, each oriented toward a land formation. The house was constructed on steel stilts to avoid severing tree roots. To cut cost as well as meet sustainability goals of the clients, the building was designed using standard sized, off the shelf sheet-goods (unfinished plywood and OSB) to minimize waste. The building was accomplished with a tiny budget (under $190 per square foot).